This high ranked Soviet/Russian Navy official was developed from idea given by one of my pen friends, mixed with design based on couple of characters from StarCraft II: Heart of the Swarm https://www.youtube.com/watch?v=qNy6lWSYne0 and https://www.youtube.com/watch?v=JPj70yn3ku4. Admiral Popov has valid reason to be afraid of - in a country, where private property is strictly prohibited, it takes plenty of mental and physical effort to conceal, what is officially called "forbidden opium for people". 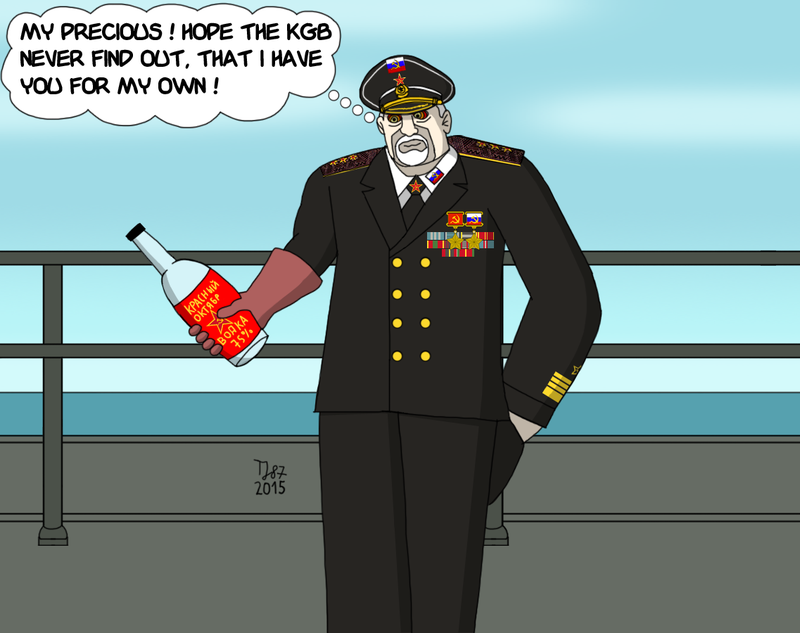 If the dreaded thugs from KGB discover, that comrade admiral hides noticeable amount of booze beyond the knowledge of the only legal party, without doubt he will get into serious trouble. Why does he wear gloves? Avoiding fingerprints is one reason, another one has been explained in my reply in the previous comment - because Popov feels cold in only one hand. 1 PLN (Polish Zloty, our currency) = 20 RR. People like him do not buy anything. He picks "samples" directly from the cargo. He also has connivance with dockers in all the harbours where his vessel calls. Indeed, it's not buying in the literal meaning of this word. Still, he's forced to make sure the dockers won't report him to KGB by giving them considerable amount of money to guarantee their silence. Just like archetypical mobsters do, while carrying out half-legal businesses. He does not even have to bribe these dockers actually, because they are big thieves, themselves. And Popov knows very well all the details of their dirty business. When he was young, Popov was a very active member of the KGB. - KGB emblem above medals. Nice idea, and it's great that you've finally realized it this way! Somehow he reminds me an older General Gradenko from Red Alert 1, or at least, he would look like that if Nadia didn't poisons his tea (probably because Stalin's request who wanted to execute him this way). Thank you so much for your wonderful present! 75% is very strong, indeed.